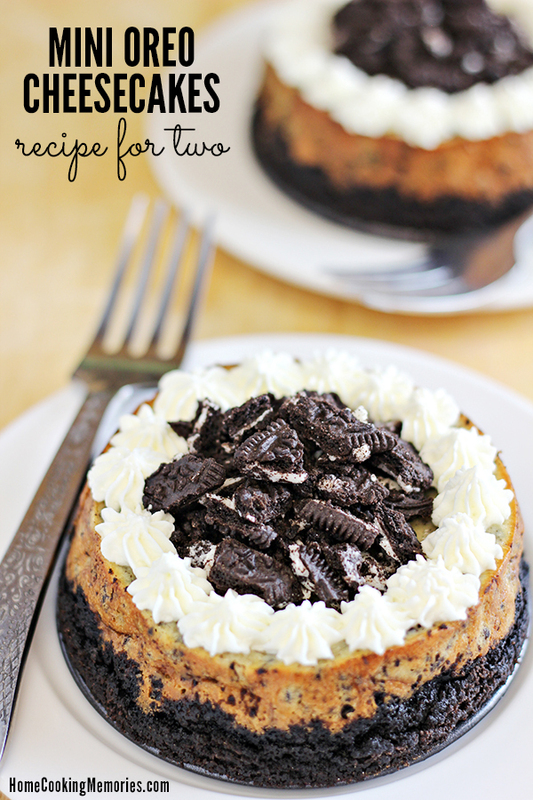 This Mini Oreo Cheesecakes for Two recipe will be the perfect answer when a large cheesecake is too much. 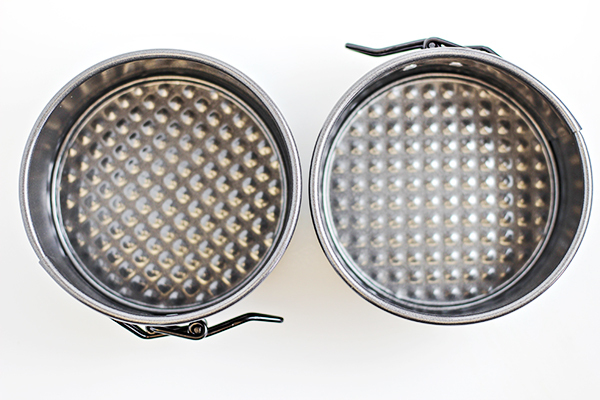 This recipe will create two small cheesecakes in little 4″ diameter springform pans. This week, David and I will be going out for dinner for Valentine’s Day. It probably won’t be on actual Valentine’s Day because I’m not a fan of the crowds, but yeah, we’re still totally using it as an excuse to enjoy a date night out. Deciding on where to go was easy. We have a sushi restaurant fairly close to the house that we love. It’s all-you-can-eat sushi, which gives you plenty of opportunities to try new things. The part I like the best is that it’s not just sushi. You can get appetizers and other items, like pork belly or shrimp tempura. Afterward we enjoy our sushi, we’ll go to to Target. Yep, you read that right: TARGET. No kids, just him and me, and that big red cart. Maybe we’ll grab a movie. Or if David gets his way, we’ll go bowling. 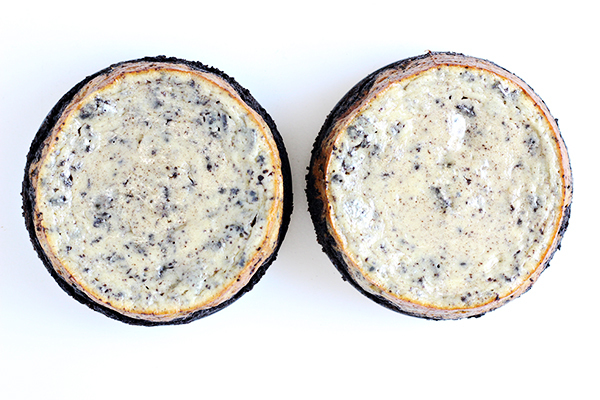 And when we get home, the dessert will be waiting for us: Mini Oreo Cheesecakes for Two. Sure, we could get dessert at the restaurant (it’s included), and sometimes we do, but by the time we enjoy all-you-can-eat sushi, the last thing you want is a bowl of green tea ice cream. But after Target and whatever else we’ll do, coming home to some cheesecake is a perfect (and delicious) end to our night. 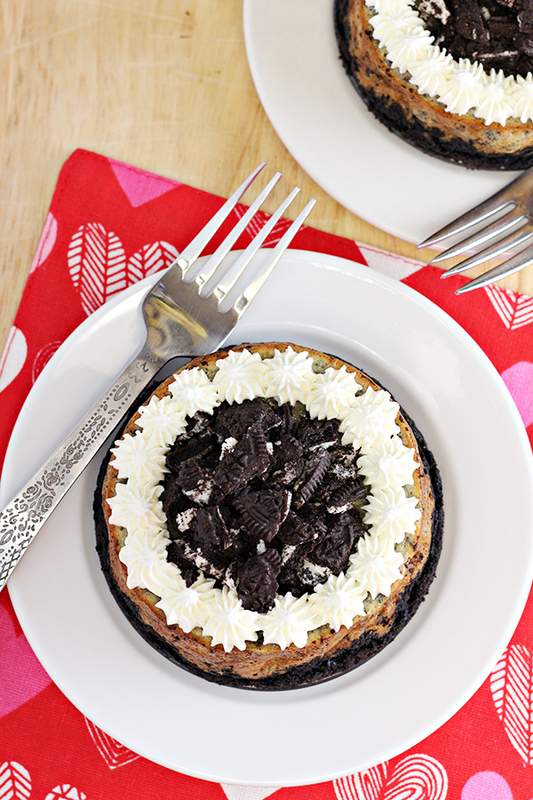 Of course, these Mini Oreo Cheesecakes for Two don’t have to be for Valentine’s Day. They are wonderful all year long, whether it’s for another special day, or just because. This recipe is also great if you want cheesecake, but don’t want leftovers. 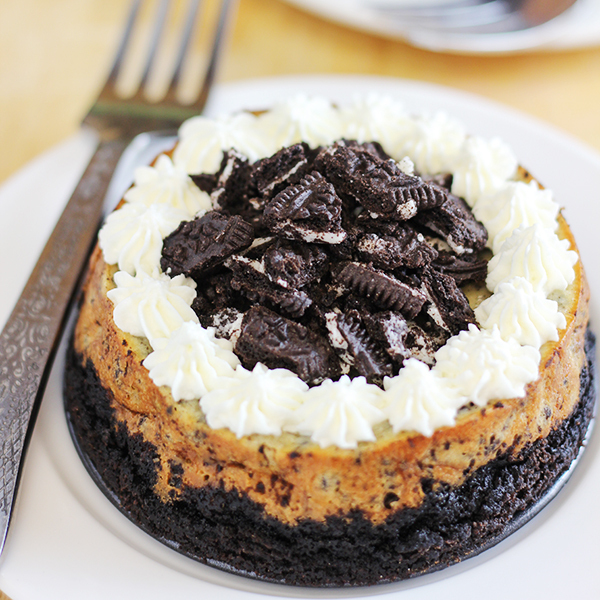 And if you love cheesecake AND love Oreos, you will be be in mini cheesecake heaven with these. 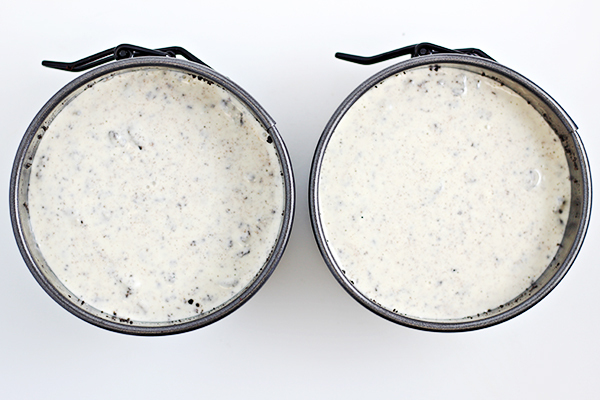 This Mini Oreo Cheesecakes for Two recipe uses two mini 4″ springform pans. The ones I used are these ones: Wilton Mini Springform Pan, Set of 3. The recipe makes two small 4″ cheesecakes, which depending on your appetite can be two servings or more. If you want a smaller serving, two people could easily share just one of the cheesecakes. If you do this, I would either half my recipe or make the recipe as listed and freeze the 2nd cheesecake for later. For this recipe you’ll need 12-14 Oreo cookies, but they will be divided and processed in 3 different ways. Some of the cookies will be finely crushed for the crust. I do this in my food processor. You’ll also need some chopped Oreos for the cheesecake batter. If you want to decorate the top, like I did, you’ll need a couple more and those are coarsely chopped. 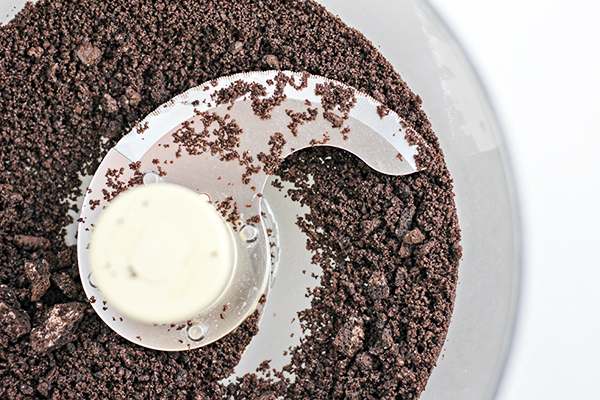 After all of the Oreo prep work, you’ll mix up your batter and divide it between two mini springform pans. The cheesecakes are baked and after they are finished and fully cooled, you are ready to decorate! You can decorate any way you like, but I divided the coarsely chopped Oreos and placed them in a pile in the middle of each cheesecake. Then, I whipped up some heavy whipping cream and added it to a pastry bag with a Wilton Star Tip #32 and added little stars around the edges of the cheesecake. Here’s the full recipe for making two mini oreo cheesecakes. If you like this recipe, we’d love for you to share it on Facebook with your family and friends or pin it to your dessert board on Pinterest. Want more Desserts for Two? Thanks so much for sharing this delicious recipe with us at Encouraging Hearts and Home. Pinned. My kids will absolutely love this, saving for a later date to make and Pinned. Thanks for sharing! OMG ! Those look amazingly delicious ! I’m printing my copy of your recipe now! Thanks so much for sharing it! Hey, Brandie! Just wanted to let you know that we loved your Mini Oreo Cheesecakes For Two Recipe so much when you shared it at the #HomeMattersParty last week, we’ve FEATURED it THIS WEEK! Hope you can check it out when you get a sec. Happy Friday!!! I love mini cakes and this one looks perfectly delicious! Pinning! 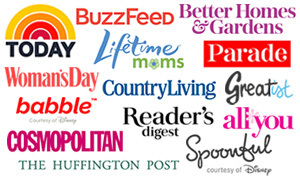 Thanks for linking up with Funtastic Friday! I just pinned your delicious dessert! I really appreciate you sharing with us at Full Plate Thursday, hope you have a great day and hope to see you again soon! 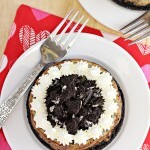 My husband loves oreos – I think I’ll make him a Valentine cheese cake! Thanks for sharing on the What’s for Dinner link up! What a cute dessert for two! Perfect for Valentine’s Day. Thanks for sharing with us at Share the Wealth Sundays! 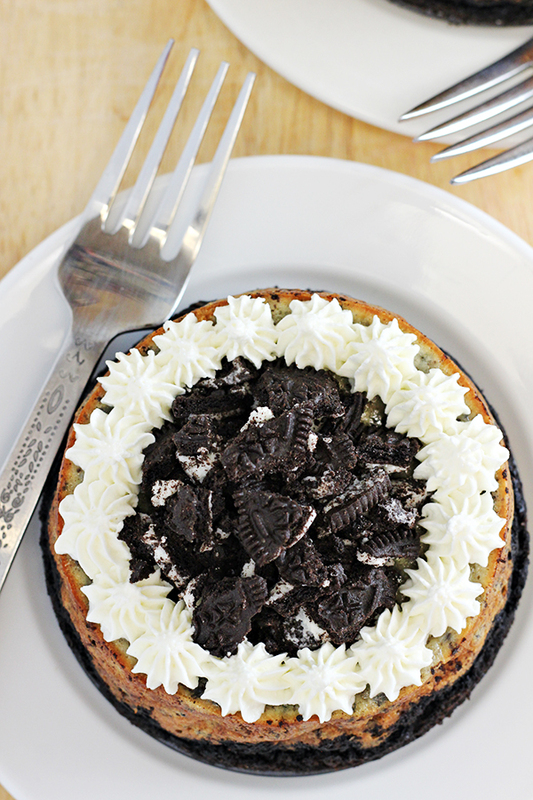 Oreo Cheesecakes! YUM!! Will definitely do this this weekend! My husband will definitely love this! He’s a sucker for Oreo’s as well as Cheesecakes! Found you through a linkup, and so glad I did! These mini cheesecakes totally rock! I’ve already added the little springform pans to my Amazon wishlist and I’ve pinned your recipe..great photos by the way! These look great and so much fun!~ I don’t know about you but there are a lot of times I think it would be nice to have a piece or two of cheesecake around but I don’t need 8 to 12 servings! Brilliant! Oh, the cheesecakes look so good! Pinned and shared! These Mini Cheesecakes look amazing! Oh my goodness! These are the cutest cheesecakes 🙂 What a perfect plan to have dessert at home after going out to dinner.